A great part of Osvaldo Romberg's work is dedicated to the question of architecture: for the artist, ground plans are the plastic elements of his utopic narration. 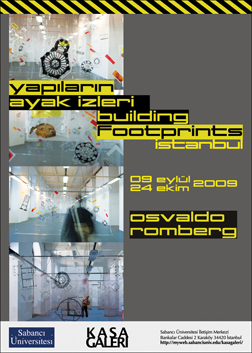 Romberg, produces installations with ‘Building Footprints’ of different architectural structures, through which he creates intellectual and formal associations via visual connections. This associations break through the restricted time frame and produce new mental contexts between different ways of thinking or between different value systems. For his installation at Kasa Gallery, Romberg is producing a maze-like layout running all the way through the adjacent rooms of the gallery. While suggesting visual effects of collage as he brings plans of various classical and modern buildings combined together with elements of modern art, found objects and ephemera, the transparent material forming both the support of this huge collage and partitions of the maze-like pathway multiplies the sense of continuity. In his large-scale installations with references to major architectural works , Romberg lays the footprint of a structure of the past over and through an existing structure. Through this technique of translocation, he raises the questions of geography, heritage and erasure. Osvaldo Romberg was born in Buenos Aires and lives and works in New York, Philadelphia, and Isla Grande, Brazil. He has exhibited wildely as an artist at institutions including the Kunsthistoriches Museum, Vienna; Kunstmuseum, Bonn; Ludwig Museum, Cologne; Sudo Museum, Tokyo; The Israel Museum ,Jerusalem; The Jewish Museum, New York; the XLI Venice Biennal, Israel Pavilion; The Museum of Modern Art, Buenos Aires; and The Van Abbemuseum, Eindhoven, among others. Romberg is also a professor at the Pennsylvania Academy of the Fine Arts and a Senior Curator at Slought Foundation, where he has curated Retrospectives on artists such as William Anastasi, Hermann Nitsch, Dennis Oppenheim, Gunter Brus, Peter Weibel, Fred Forest, Gary Hill and others.